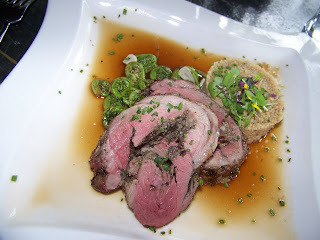 Our second course to prepare (and devour) at On The Marsh in Kennebunkport, ME was leg of lamb stuffed with a mushroom duxelle. 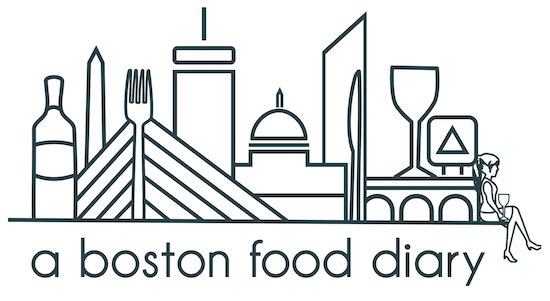 If you are a frequent reader of A Boston Food Diary you may realize that my feelings for lamb are not in the "like" category, nor really the "love" category, but more the "OBSESSED" category. If it's on a menu, most likely I'm going to order it. 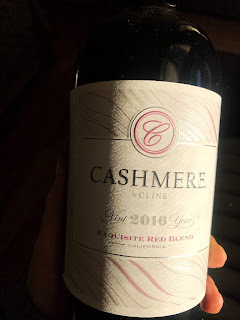 I love its light taste, its lovely soft texture, and its ability to showcase so many different flavors. It's a beautiful, wonderful meat. The chance to learn how to cook such a delicious dish using this protein- well-if I could have been transported any further into heave, I would have. 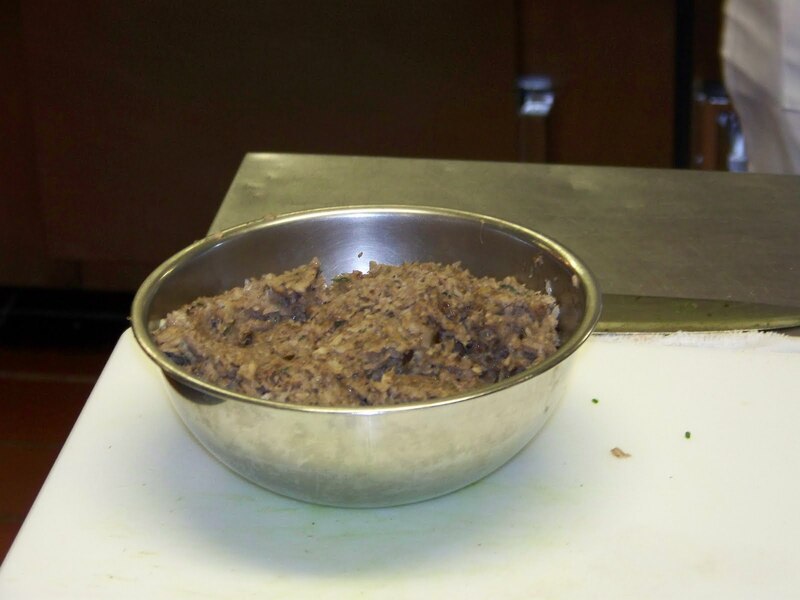 We started by making the mushroom duxelle which began by removing the non tasty parts of about 6 different types of mushrooms. 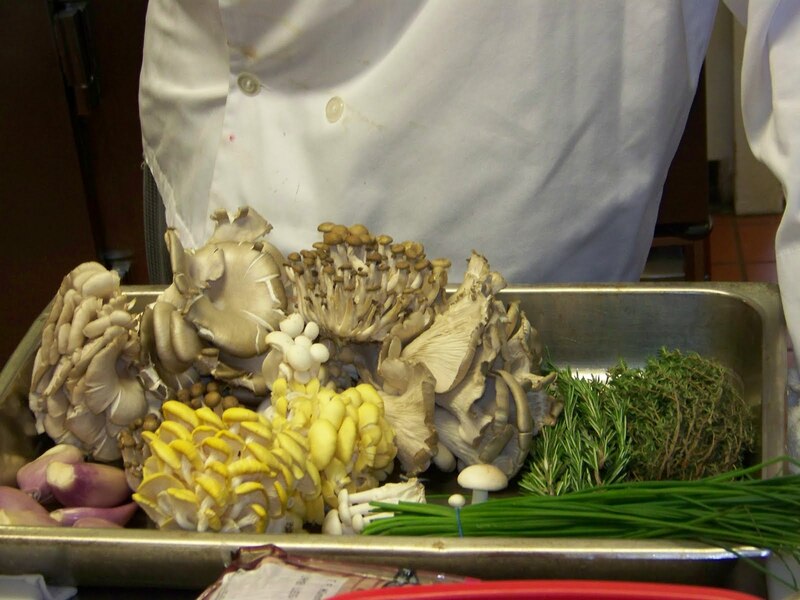 I unfortunately do not recall all of the varieties that we utilized, though I know that there were two types of Oyster mushrooms....mmm mushrooms. So we began, by removing the hard sections that hold the clumps together, and by chopping half a quart of shallots. The mushrooms and the shallots were then combined into a food processor and finely minced. Chef Jeff then placed these into a saute pan with vegetable oil and cooked over high heat for 15 minutes. Then he de-glazed the pan with red wine, added a finely chopped bunch of thyme (John and I worked very hard on that thyme) and salt and pepper. For something that sounds somewhat complicated (or maybe that's just me- but "duxelle" sounds complicated) I couldn't believe how simple this was. After it was all combined, the mushrooms had melted to almost a paste, and to me the end product reminded me of a darker pate. He transferred it to a bowl and set it aside to cool. The next part of our course was one of the most fascinating. 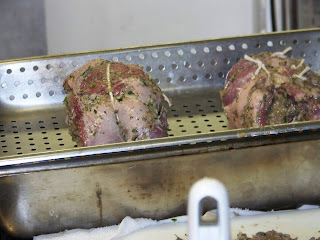 Chef Jeffrey showed us how to "clean up" the leg of lamb so that each bite would be succulent and delicious. 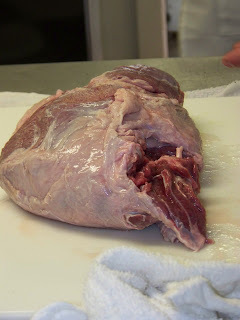 He did this by first cutting through a section of the meat so that it lay flat. Then he began to work through the meat removing any unnecessary fat, membrane or just those hard modules you sometimes find. This whole process was so fascinating to watch! He identified the membrane as "silver skin" because of its iridescent appearance. He also noted well that waste, while limit-able, is impossible to avoid. Often to get a piece of something unwanted out of the meat, good pieces are lost as well, though he noted that many of these can be trimmed away from the "bad" part and used for other dishes, such as a shish-kabob on the grill or stew. Mmmmm lamb stew! 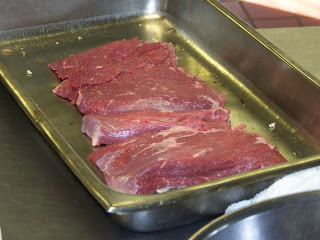 When he was done cleaning the meat, it looked wholly different than when he began, smooth and neat. He separated the meat into two pieces, and then tenderized both pieces with a meat tenderizer mallet. I have to say-I've always seen this done-but have never actually used a tenderizer. I have no idea what my aversion to it is, but man- I've really been opposed to it. I think I'll have to run an experiment soon to see the real benefit of beating a piece of meat with one of these mallets. Other, of course, than taking out my own aggressions. 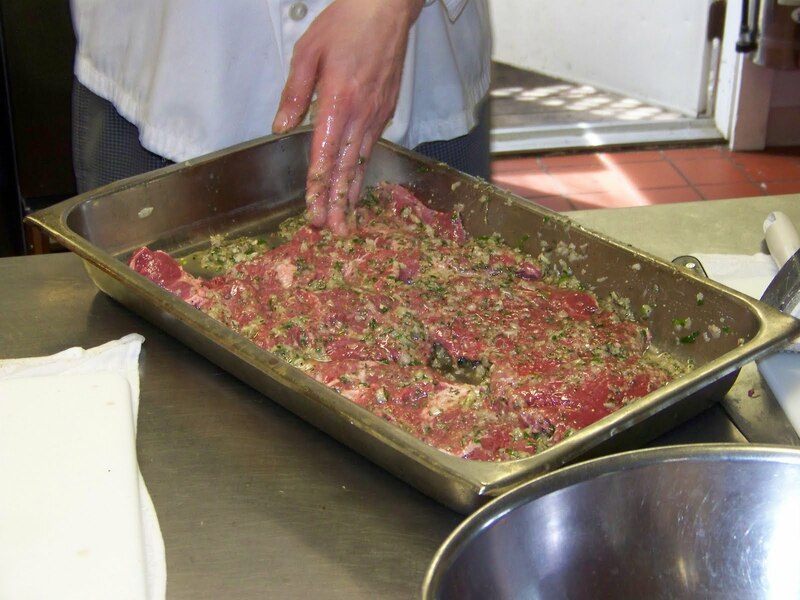 I digress, when chef Jeffrey was done with the tenderizing, he coated both sides of the meat with a quick marinade of olive oil, rosemary, shallot and mustard. Then he laid a thick coating of the (cooled) duxelle on top of the meat and began to roll them firmly so that they rolls would be somewhat tight, and not too loose. He tied it in the same fashion, using 5 pieces of twine, three around the bulk, and two around the ends but ever careful to be cognizant of the pressure on the meat. Once tied, these gorgeous rolls of lamb, herbs and mushrooms were placed into an oven to roast. This was the second course that was served to us in the dining room, and as much as I could have eaten three bowls of the Potato & Leek soup- the Lamb was just as addictive. 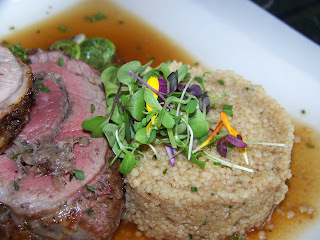 The chefs had plated the lamb rolls with a side of couscous decorated with multicolored micro greens, lightly sauteed fiddle head ferns and just a ladle of stock on the plate. The presentation was beautiful. As lovely as the plate was to look at however, it tasted even more delicious. The lamb was a perfect medium rare, with beautiful notes of rosemary and shallot present, but not overpowering the subtle lamb flavor. The really wonderful part was the shallot flavor from the lamb melded so nicely into its subtle hints in the mushroom duxelle. The duxelle was a really lovely accompaniment to the lamb in its own delicate nature. The couscous and the fiddle heads (another vegetable that I refused to eat as a child...and, um, last week) were the perfect choices for sides with this lovely spring dish as they were both light and flavorful. The couscous with that almost impossible creaminess, and the fiddle heads that had been sauteed so lightly in garlic with strong notes of their natural flavors and lovely garlic. Next we explore fire-and all of the fun we can have with it! Oh my! I CANNOT WAIT to hear the details!! What a perfect surprise! Farmer's Market time is here again!!!! ABFD's Very First Original Recipe Contest!